There is enough theoretical energy available in the wind to meet all of the world’s energy demand. Airborne wind turbines that convert steadier and faster high-altitude winds into energy could generate even more power than ground- and ocean-based turbine units. New research from Carnegie’s Ken Caldeira examines the limits of the amount of power that could be harvested from winds, as well as the effects high-altitude wind power could have on the climate as a whole. Their work is published September 9 by Nature Climate Change. Led by Kate Marvel of Lawrence Livermore National Laboratory, who began this research at Carnegie, the team used models to quantify the amount of power that could be generated from both surface and atmospheric winds. 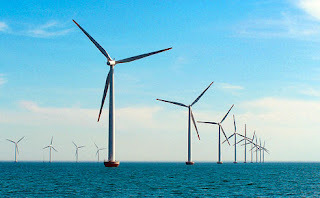 Surface winds were defined as those that can be accessed by turbines supported by towers on land or rising out of the sea. High-altitude winds were defined as those that can be accessed by technology merging turbines and kites. The study looked only at the geophysical limitations of these techniques, not technical or economic factors. Turbines create drag, or resistance, which removes momentum from the winds and tends to slow them. As the number of wind turbines increase, the amount of energy that is extracted increases. But at some point, the winds would be slowed so much that adding more turbines will not generate more electricity. This study focused on finding the point at which energy extraction is highest. Using models, the team was able to determine that more than 400 terrawatts of power could be extracted from surface winds and more than 1,800 terrawatts could be generated by winds extracted throughout the atmosphere. Today, civilization uses about 18 TW of power. Near-surface winds could provide more than 20 times today’s global power demand and wind turbines on kites could potentially capture 100 times the current global power demand. Global wind power installations increased by 41,236 in 2011, bringing total installed capacity up to 238,351 MW, a 20.6% increase on the 197,637 MW installed at the end of 2010. For the last two years more than half of all new wind power was added outside of the traditional markets of Europe and North America, mainly driven by the continuing boom in China which accounted for nearly half of all of the installations at 18,000 MW. China now has 62,733 MW of wind power installed. This is a far cry from the theoretical potential. At maximum levels of power extraction, there would be substantial climate effects to wind harvesting. But the study found that the climate effects of extracting wind energy at the level of current global demand would be small, as long as the turbines were spread out and not clustered in just a few regions. At the level of current global energy demand, wind turbines might affect surface temperatures by about 0.1 degree Celsius and affect precipitation by about 1%. Overall, the environmental impacts would not be substantial. "Looking at the big picture, it is more likely that economic, technological or political factors will determine the growth of wind power around the world, rather than geophysical limitations," Caldeira said. For further information see Global Wind.